Best Chinese Knives: New Cold Steel Voyager XL Clones - Looks like Third Shift OEM to me! New Cold Steel Voyager XL Clones - Looks like Third Shift OEM to me! I've already posted about this knife in the first compilation, but decided to feature it in a separate post. 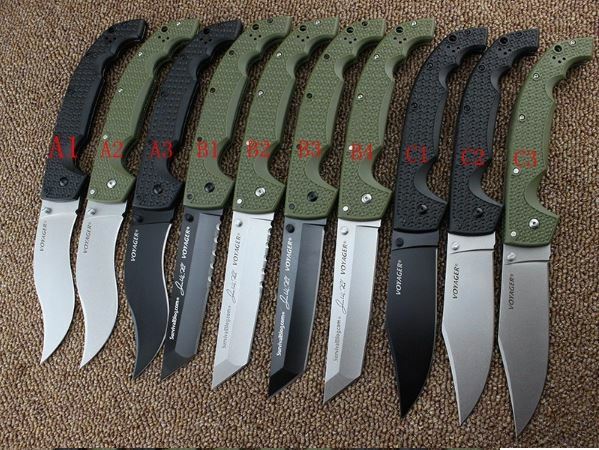 Recently, new lot have become available, that has 10 variations of this knife, which led me to think this is an OEM production from China. This means products that are made from the same materials, using the same equipment and by the same people, but during what is called the "Third Shift" - during or after the manufacturing some knives do not go to the knife company (Cold Steel in this case), but are sold to dealers to be sold on AliExpress or other platform. The original knife is made in Taiwan, which is basically China, without saying the name - so it would be pretty simple to move those or to "borrow" the prints and programs and make the clone by it. I'm not sure in this case, but the variety of the models and the similarity to the real one, makes me believe it actually might be so. It would be interesting to me to hear what you guys think on this subject - in your opinion, is this OEM or just a well made clone? Link is not working. Maybe, sold out?